It’s with great pleasure that I can stand here tonight and address you all on this momentous occasion, I’m very honoured and humbled by the opportunity. For as you all know, tonight sees the graduation of the European Law School’s inaugural graduation class, an evening that sees nine students of remarkable calibre and ability from all over the continent enter into a Europe that now more than ever needs them. Europe, as we all know, means many things. An economic system, a legal system, a cultural matrix, a dream, a nightmare, history, the future, our very present. Without daring to offer my own definition of Europe, I can only say that Europe for me is a sea of culture, its tide reaching as far as the Urals, the Dead Sea, the polar ice caps, a little island, called Ireland. 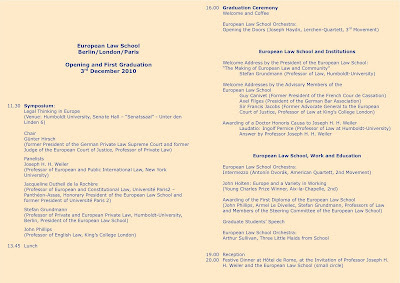 For myself now today here in Berlin, in this wonderful university so resplendent of history, it’s been a long sea journey from my roots in a small little town on a very troubled border in northeast Ireland. First as a student and teacher in Paris, then in Norway and most recently in Germany, I’ve come to land in this culture, and working in it, embracing it, investigating it as thoroughly as I can, all this has brought me to places I could have only dreamed of as a boy, in front of people as fantastical as those who populated the adventure stories of childhood: it has taken me somewhere as special as in front of you, ladies and gentlemen, this evening. And how very lucky I am. 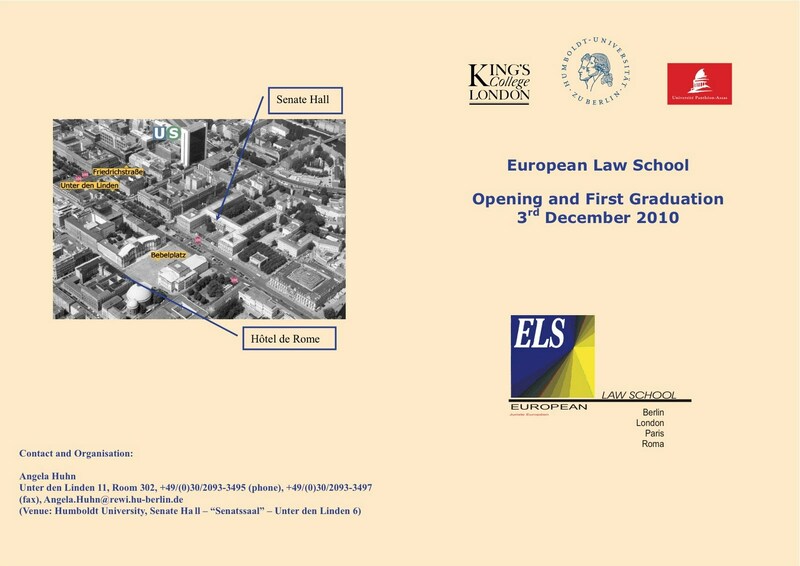 Dear graduates, as the first of hopefully many to have completed this unique, bold course, you are exceptionally well placed to go out and enter this heaving, shapeshifting sea we call Europe. Navigating it, working in it, living in it, does not mean something abstract, despite my reliance on metaphor! No – it means working like millions have for centuries, taking over the controls that have been so carefully made by your elders. The only abstractions I would like to talk about this evening – based on my own experiences of wrestling with this sea, of understanding the world I live in – are courage and ambition. 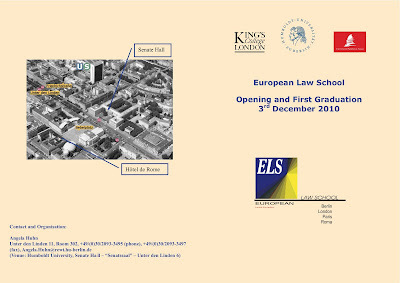 Because what you have experienced during your time in the European Law School and what you will experience as soon as you step out into the world of work or further study, applying this education, is what the French historian and statesman François Guizot first identified as the prime characteristic of this difficult concept Europe – that is: diversity. To leave the country you grew up in, where everyone speaks the language you’ve known your whole life, a place where you get all the pop-culture references and the cycles of the seasons never seem to surprise: this movement takes a certain, admirable amount of courage, and is only matched in intensity by the amount of ambition you each bring to bear on your successive, diverse worlds. And no matter what definition of Europe you hold to, no matter what form it takes in your head, it is merely like the Aral sea in Uzbekistan, slowly evaporating into non-existence, without the life-giving tributaries that are your, the next generation, ambitions. And built into ambition is the idea of success. Success is a funny thing: in our present age success would seem to hold sway over many people’s actions and intentions. But success is a hungry animal in my experience: it is very seldom that one sates success’ appetite oneself. It is masked by ambition. But let me do the honours this evening: you have all sated this determined animal’s hunger by graduating from this novel, ambitious study programme. You embody that great thing: success where nobody has succeeded before. And before you let the mask of ambition be donned once more, before you start out on your plans to takeover the captaincy of this ship, pause a moment and enjoy this success. Everyday now we are confronted with a new ‘crisis’ in Europe. There is no doubt that these are turbulent, and dare I say it, exciting times. My own country not least has felt the pressure. And while emigration has come back to haunt the youth of Ireland, I know myself the benefits to be gained from travelling and living abroad: I came to Berlin two years ago and since that time I’ve done my best to get lost in its cultural marvels, an endless conversation with people from all over the continent eager to create something, to interpret this difficult world. For if the leaders of our respective countries meet to discuss bail-out plans and interest rates, should not we also get to meet each other? And the courage it takes to go out there and meet each other, to find our way in this new place that is somehow supposed to be different because we were born in a foreign land and hold a different passport leads very clearly to personal enrichment, personal success. And it is this personal success each one of you have already achieved that enables the structures overarching the legal, economic and political levels of Europe to exist in the first instance. My heroes, people who left that little island long ago in times no less turbulent, James Joyce, Samuel Beckett, remind me constantly while I try and find my way working in this great diversity of Europe, of the courage that it takes to set no horizon too wide. Joyce roomed around Europe with his family – not always an easy journey, met with derision from friends and family – dodging a war here, a war there, and out of it he created a success many would deem today unsurpassable in the field of literature. Europe was his launching pad, and the cosmopolitan, international centres of Trieste or Zurich – so similar to so many of Europe’s cities today – were his pool of inspiration, and out of Europe he floated works of art that immortalised one little country and showed how even it, an Ireland not yet even sovereign, could join this diverse sea of culture we call Europe. Beckett even more so: he made France his home; he fought for France; he adopted the French language. Heroes such as these, for me, betray the lie that the difficulties inherent in Europe’s diversity halt progress, work or inspiration. On the contrary. If the courage is taken to ride out and cross these once barb-wired topped borders, the return is multiplied infinitely: success is yours to be had. There is no such thing anymore as exile in Europe, only a change of one’s scenery. For as another Irishman, Edmund Burke stated as long ago as 1796, ‘No European can be a complete exile in any part of Europe.’ And it is up to us to defend and bring to fruition the possibilities built into such an amazing idea – none of us can be an exile anywhere on this continent. And while this for some opens an extremely exciting, new moment of history, for others it creates anxiety, and recourse to those perspectives that have plagued Europe through the centuries. Your challenges today as young legal professionals are legion. The very movement of a globalised world gives rise to a need to review the legal framework surrounding immigration. Free speech, the spread of information, a common EU foreign policy – the examples are endless of what you can work toward. There are forces amassing that echo back to the darkest days of the last century and this city knows all about this echo. And the rule of law, at a transnational level, offers the prospect of what the founding principles of the EU had as their ambition: peace in Europe. Peace built on mutual understanding, respect, justice. To take on Europe then, whatever definition of it you wish to choose, is a courageous act, an ambitious one. For we must put ourselves out into its waters in dialogue with its great, difficult history. We must confront the wars, the catastrophes as our own, the genocide and betrayals that have plagued the continent: to do this is a real graduation, a real education. Because armed with this past we can work in Europe’s diversity for a remarkable future, a future that is predicated on us having the courage to be our own heroes. L'avenir est inconnu, mais en même temps, c’est vous. Cela est certain. Et l’avenir dure longtemps.